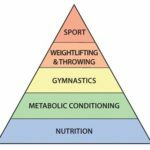 The image below represents the fitness pyramid that we use as a framework for athletic development when working with athletes of all shapes and sizes. The important idea with any pyramid is that it is built from the bottom up. This pyramid takes our key components of fitness and places them in building order. The bottom of any pyramid has to be the strongest because it supports everything that is built on top of it. You cannot reach the top without first establishing a solid foundation. If the base of the pyramid is not solidified then your entire pyramid will collapse. At the bottom of this pyramid, we can find nutrition. As many of us know how we fuel our bodies will greatly determine how well we perform. If you are not taking in enough healthy and beneficial nutrients then your overall health will lack greatly. Once our nutrition is in check we can then move on to the next building block called metabolic conditioning. This idea of metabolic training refers to conditioning exercises intended to increase the storage and delivery of energy for an activity. Our body has 3 main energy systems, ATP-phosphate (explosive power), glycolytic (mid-distance), and oxidative (>90 seconds) and we should be able to utilize each of these. Too many times I feel like many athletes overlook this vital component of our pyramid, metabolic conditioning. If your goal is striving for fitness then this cannot be ignored. This also means working out in all aspects of our metabolic conditioning. Not only doing the short 5-7 minute workouts. We must exercise our anaerobic side along with our aerobic side. If you’re the person that cherry picks and only does short 7-minute workouts and skips the longer conditioning workouts then your overall fitness is going to lack. While 1 rep maxes and short workouts are fun, it is not what our pyramid is built upon. Build the foundation or the entire pyramid will collapse. Stick with the programming and as I’ve said before DON’T cherry pick. See you all at the box!